What is it that your interviewer will want to find out about you, and how will that information help them to make up their mind? the best way to prepare for an interview is to think about how you can answer the questions that will arise. In particular, your answers need to address the underlying concerns your interviewer has. We often assume that interviewers will take delight in trying to trap you with trick questions. I shan’t pretend that never happens. It does, and for different reasons. Some interviewers are too motivated by the power of their situation, and frankly enjoy making interviewees feel uncomfortable. Needless to say, they are not good interviewers. I’ll consider in a moment how to deal with them. Others are using carefully constructed ‘trick questions’ that have been agreed internally, and are used consistently for all candidates. These are different, and are used most famously by organizations like Google. Most Project Management interviewers, however, are simply interested to find out about your experiences, your skills, your understanding, and your style, so they can fairly assess whether you are the right person for the job. Let’s examine the three circumstances. answer honestly and concisely, illustrating your answer, if you can, with a a real example. In the next section, we will look at what things your interviewer will be most interested in. If the organization has made a conscious decision to try and stump candidates with difficult questions during its Project Management interview, it will almost certainly have done so for a good reason. The less likely reason ill be to see if you know the answer. It is much more likely that what they are really interested in is how you respond to the pressure of a challenging question that you cannot easily answer. And if they are doing their job well, you won’t have been able to prepare either, because the question will not be one that is widely used or published. They will be interested in the process you take – it will be an attempt to simulate how you will solve a problem under pressure, as a project manager. So your response needs to mirror the style of response you would expect and claim to have as a Project Manager. Stay calm and assess the question. Ask for more information, if there are clear gaps, and then take a systematic approach. Often, that will mean breaking the question into components and gradually assembling an answer. Be aware of ambiguity and alternatives. Note the merits of different solutions and set out your reasons for making the choice you do. This will give you the best chance of impressing your interviewer with how you handle their question. There is another thing to note with this kind of question – and also something that will distinguish it from a power player trying to trip you up. The interviewer will often help you with prompts if you get a little stuck, and test your thinking, as you make progress. Accept the interviewers comments and consider them carefully. They have made them for a reason and they want to see how you respond to them. If you aren’t sure whether the trick question is part of the process or just a power play from an aggressive interviewer, don’t worry. The right way to handle the question is the same in both circumstance. The Power Player who tries to trip you up with an unfair question is really just a bully. The best way to handle the situation in the short term is to stand up to the bully by confidently asserting yourself, without creating a conflict. So, stay calm, assess the question, and answer in a reasoned, step-by-step way. In the longer term, if you do get a the offer of a Project management job from this organization, you need to consider carefully. I recommend you speak with the HR department to find out whether the adversarial style of questioning you received was deliberate, and part of a structured interview process, or whether it is either an artefact of an aggressive culture or a characteristic of that interviewer. The answer to this question will help you decide whether this job, and this organization, is right for you. What is a Project Management Interview About? Your approach – they will want to know how you will approach the kind of situations they can envisage within their organization. A lot of the questions will therefore be about gauging where you will come down on a spectrum of possible answers. Rarely will an extreme position be appropriate and, even if you choose one and defend it effectively, they will want to see that you have an uderstanding of the nuances and balances at play. We will look at each of these three components of a Project Management interview in turn. What are your reasons for wanting to be a Project manager, and what gets you motivated in general. One thing they may be specifically interested in is the extent to which your desire to manage projects is part of a long-term strategic career aspiration, or a tactical desire to take this particular role. either response can be a good one, as long as they can clearly see that you know what you are doing, and that there will be a very solid commitment to doing the job well, for as long as it takes to get it done. You may want to look at our article on ‘Why a Project Management career‘. Project managers can sometimes face political challenges and ethical dilemmas. A good Project Management interview will often want to check that you are alert to these kinds of situations, and find out how you would resolve them. Your interviewer will also be interested to assess the values you will bring to bear, and the extent to which they match the values of the organization. It’s always a good tip, to find out what the published values are for any organization that offers you an interview. At the very least, you will see how seriously they take their values and the extent to which you would be comfortable working with them. Often this area of questioning will be tackled by either looking at examples from your experience, or by setting you a scenario or hypothetical challenge. This may feel like some form of trick question, but it is not. It is a perfectly reasonable attempt to gauge how you would respond to a plausible situation. Because project managers often have little or no formal authority over the people involved in your projects, one of the most important things for a Project Management interview to assess is your ability to influence without power. Once again, examples and scenarios are going to be how they ask the question, so prepare well by mining your past, and also by thinking about how other people you have worked with have influenced effectively. Being a Project Manager is tough. Particularly if you are new to the role, one of the questions in your interviewer’s mind will be around how you will cope when the pressure of the role rises. In part, a concern about resilience can be a driver for a seemingly aggressive questioning and challenging style. The best way to see how you handle pressure is to put you under pressure. That said, good interviewers also know that this kind of pressure may not be a fair simulation of real-world project pressure. So also expect direct questions about your experience. The one thing to avoid is a dismissive or arrogant attitude. Your interviewer will know that far tougher people than you have been broken on the wheel of a difficult project. They will be less interested in ‘can you cope’ and more interested in how you will cope with the pressure. To what degree do you thing twenty moves ahead, or two moves ahead? Interviewers like to understand how you plan and over what horizon. If there is a right answer to this, it will depend on the culture of the organization, and the kinds of projects it takes on. You know well enough that both soft people skills and hard technical skills are important for a project manager. A Project Management interview will be trying to get a feel for where your strengths are on a spectrum from ‘people person that doesn’t do rational analysis’ to ‘practical thinker, who finds it hard to relate to people’. Don’t try to pretend you are excellent at all points on the scale if you are not. An honest appraisal of where your strengths lie will help the interviewer make a wise choice. Problem solving is a big part of Project Management, and your interviewer will want to know how you approach it. There is no point in focusing on the ‘good or bad at it’ angle. What kinds of problems are you familiar with, and how do you start to tackle a new problem? Project Managers always need to deal with more senior executives, and sometimes non-executives too. How do you build relationships and get the support and giuidance you need? And how will you win their attention and engage them fully when you need their input. The relationship with sponsors, clients and senior stakeholders is ften a stumbling block for newer Project Managers. What would any job interview be without looking at your experience? 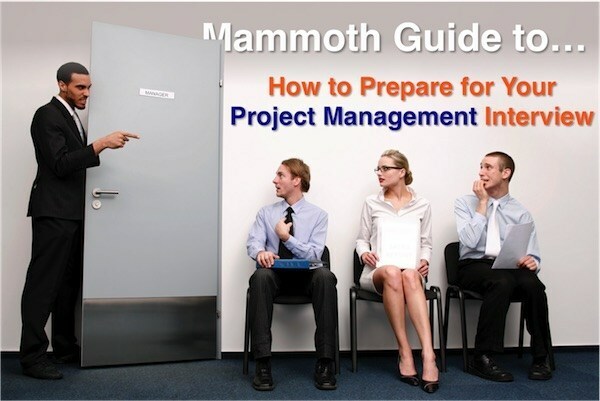 The important thing here is to consider how to respond if you are going for your first Project Management job. Your task is to find relevant experience that will give evidence of your suitability for for the role. The complementary component of your Project Management interview to the bit about experience, is what do you know? Training alone is rarely enough to compensate for zero relevant experience. But when you can combine your learning with experiences, to draw lessons; you can make a little experience go a long way. As you may expect, having read this far, often your interviewer will be less interested in what training you have had, and more in what you earned from it and how you have applied it. You cannot divorce the more technical project skills from the human skills of managing and leading people. These too are vital for a Project manager, so do expect to get questions on these too. If this will be your first managerial role, prepare for your Project Management interview by thinking about what you have learned by observing others in managerial and leadership roles. The more senior the role you go for, the more likely you are to encounter questioning that is designed to understand your level of wider awareness of your industry sector and your profession. In particular, interviewers like to assess your awareness of Project Management trends, and how you think they will be relevant to the job you are applyiing for. What are Some Typical Project Management Interview Questions? Good interview questions have the ability to provide insight into several areas that your interviewer is interested in. So it is not sensible to map questions one-on-one, into all of the specific areas we have covered. But for convenience, I have split up my long list of possible Project Management interview questions you should prepare for. I have used the three main categories: you, your approach, and your knowledge and experience. What attracted you to Project Management? Where are you on your PM career journey? What motivates you on your projects? Tell me about an ethical dilemma you have faced, and how you resolved it. Why would you decline to work on a project? Tell me about the last time you persuaded someone to change their mind? What project are you most proud of, and why? Tell me about the toughest time you have had on a project. What types of projects do you like to work on? What is your fundamental project management philosophy? How do you go about defining and planning a project? What are the most important skills for a Project Manager? When you start a new project, what are your first priorities? You are offered a new project – what questions would you ask, before accepting it? How do you manage clients or sponsors (maybe scenarios)? Tell me about how you have delegated an important piece of work. Tell me about a time when you resolved conflict on a project. How would you deal with an underperforming colleague on a project? What have you done to improve Project Management where you are working now? Describe a time when you faced a challenging project problem. How would you handle the situation where a sponsor or client refuses to face up to a project risk? How do you handle project politics? Tell me about your last project. Tell me about your most challeging project. Describe a failed (or unsuccessful) project. Tell me why a recent project was a success. Tell me about the most important lesson you learned on a project. Describe in detail one project management method or tool and tell me why it is important. Do you use formal methodologies? What in your view are the main reasons for project failure? Your project is running late… what can you do to get it back on track? Your project is over budget… what can you do to get it back on track? Your stakeholders are unhappy… what can you do to win over their confidence? Your client is vague about their project requirements. What questions will you ask? What was the sequence for planning your last project? How do you motivate people on your projects? What are the most interesting trends in Project Management at the moment? Which Project Management trends are most influential to you? How do you assess our projects in the light of any major trends you are aware of?